While NASA has suggested delaying the next astrophysics decadal survey to incorporate science results from JWST, many astronomers want to stick to the current schedule. WASHINGTON — With uncertainty about the future of two large space telescopes, NASA is continuing to suggest that the next decadal survey for astrophysics be postponed, a move opposed by many astronomers. Recently, the Cosmic Origins Program Analysis Group, one of three advisory groups chartered by NASA to support the agency's astrophysics program, sent out a questionnaire to astronomers asking for their thoughts about delaying the next survey, currently scheduled for release in late 2020. The decadal survey identifies priorities in astrophysics research and prioritizes both ground-based and space-based observatories to carry out that work. 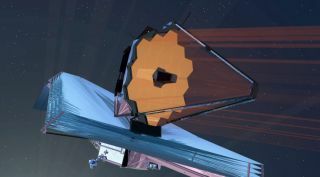 Of particular interest is what the survey identifies as the top-priority flagship, or large, mission for the next decade, missions in the past that have includes the James Webb Space Telescope and Wide-Field Infrared Survey Telescope (WFIRST). The current schedule calls for starting the next decadal survey, known as Astro2020, around the end of this year with the selection of a chair of the committee that leads the study. That schedule would lead to the completion and release of the report by late 2020. That schedule was intended to accommodate earlier schedules for JWST, which was to launch in October 2018. The early science the telescope performed could then be incorporated in the Astro2020 committee's work to refine its priorities. With JWST now scheduled to launch around May of 2020, that is no longer possible under the current schedule. WFIRST, the top priority in the previous decadal survey released in 2010, is also shrouded in uncertainty. The administration proposed cancelling the mission in its fiscal year 2019 budget request, even as the project was incorporating revisions to lower its estimated cost to $3.2 billion. Immediately after NASA announced the latest delay in JWST, Zurbuchen proposed delaying the Astro2020 study by two years. At a May 2 meeting of the National Academies' Space Studies Board, he reiterated his desire to delay the decadal to avoid a "missed decade" in astrophysics. "I think it will be easier to do after Webb flies and is successful," he said. "It's very hard to do a visionary and a great decadal while half the decade is already allocated for, and some of the big strategic missions have not cleared the queue." Paul Hertz, director of NASA's astrophysics division, offered a similar assessment at the meeting. "NASA's highest priority isn't to delay the decadal survey," he said. Instead, he said the agency's priority was an "ambitious" survey "that provides the government with the priorities we need to lead the world in doing astrophysics in space." Many astronomers have no desire to delay Astro2020. "We have very good knowledge of what to expect when we get on orbit" with JWST, said Marcie Rieke, co-chair of the Committee on Astronomy and Astrophysics, at the Space Studies Board meeting May 2. On JWST's current launch schedule of May 2020, she said, the first "early release science" results from the telescope would be published in late 2020, around the time Astro2020 is released. "When you think about that, that's very nice timing," she said. "If you have a decadal survey that projects doing more big stuff, but you can show gorgeous results from the one you just finished, that's a nice sales tactic." Any decision to delay Astro2020 would have to be coordinated with other agencies that support the study, such as the National Science Foundation, which uses it for planning ground-based observatories. However, shortly after NASA announced the latest JWST delay, an NSF official said the decadal should remain on schedule. "We're going to have to have some more discussion among the three funding agencies," which includes the Department of Energy, Rieke said May 2. "The NSF has made clear that they would like to start on time. Anecdotal discussions among various astronomers imply that astronomers would like to move ahead and start on roughly the current schedule." Zurbuchen said he would follow the desires of the astronomical community regarding the schedule for Astro2020. "At the end, the decadal is the community's decadal," he said. "I will follow what the community says."